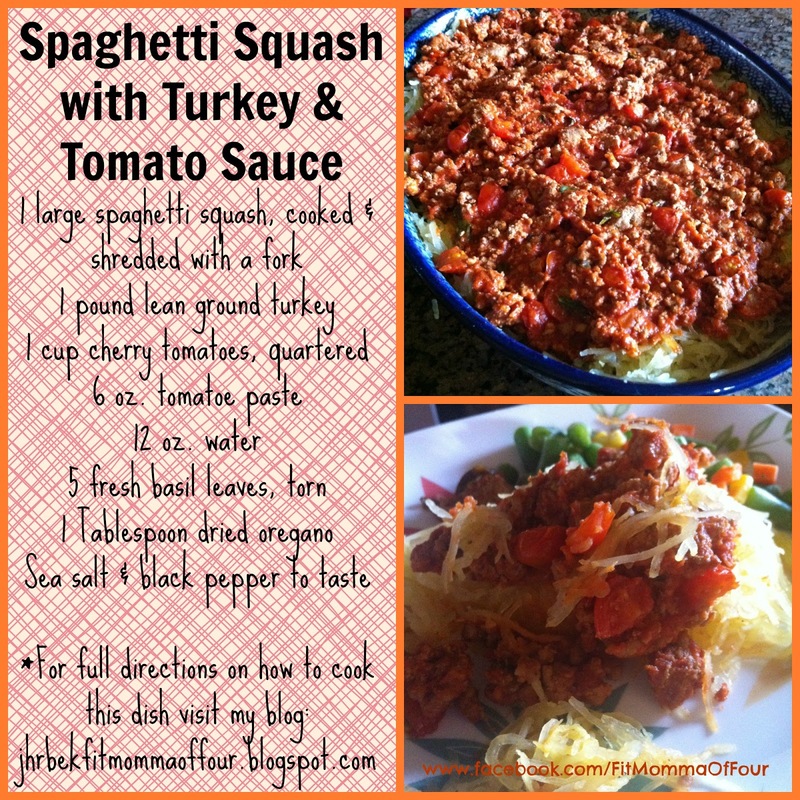 I made a double batch of this the other night for dinner & it was a hit! So good that the kids CHEERED for the leftovers. To cook the spaghetti squash preheat the oven to 375. Pierce the skin of the spaghetti squash with a sharp knife & microwave for 5-6 minutes & then let stand in the microwave for 5 minutes. Cut the squash in half, lengthwise & scoop out the seeds. Place squash on a cookie sheet, skin side down. Drizzle with extra virgin olive oil, sea salt, fresh ground black pepper, & garlic powder. Cook approximately 30-40 minutes, until squash is tender. Remove from oven & shred the flesh with a fork. To make the sauce, season the ground turkey with sea salt & pepper, then brown the meat. Add 1 cup cherry tomatoes, quartered, 6 oz. tomato paste, 12 oz. water, fresh basil, 1 Tablespoon dried oregano, 2 teaspoons garlic powder, sea salt, & fresh ground black pepper. Stir well & simmer on low heat until the sauce has reached desired consistency. Click here to check out other clean eating recipes!